The Water Reclamation Plant in Windhoek is internationally known as the first plant in the world to reclaim domestic sewage for potable use. Photo provided by: City of Windhoek. Augmenting drinking water supplies through the direct reuse of waste can be undertaken safely and efficiently, mitigating for the effects of climate change on water supply, and could be useful for other nations. A multi-disciplinary team approach is most effective in ensuring proper installation and operation of ground breaking technologies. There are added environmental benefits. Water reclamation plants can also be used for the conservation of streams, wetlands and ponds, and nutrient-rich treated wastewater an be used in agriculture to reduce the use of fertilisers. Namibia is the most arid country in Southern Africa. Windhoek, the capital of Namibia, has an average annual rainfall of around 370mm, while the average evaporation rate is 3400mm. 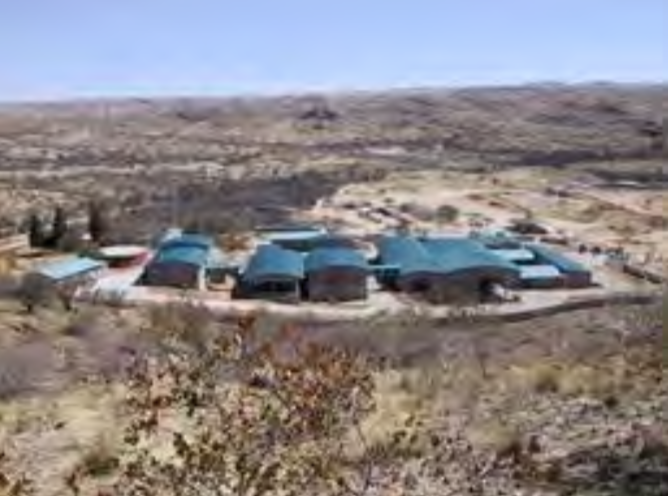 In 1968, the Goreangab Water Reclamation plant was built by the City of Windhoek to reclaim water directly from domestic sewage effluent. In 2002, a new, larger Goreangab Reclamation Plant was completed to replace the original plant, using the latest available, proven water-treatment technology. The upgrade was to ensure the security of the potable water supply, mitigating for future water stresses in the region due to climate change. The plant was developed to totally utilize available effluent from domestic wastewater (from the Gammams Wastewater Treatment Works in Windhoek, built in 1965). The plant was designed based on extensive experience (30 years) and research conducted locally, and on input from international experts to assure compliance with the strictest water quality guidelines applied internationally. This study summarises these upgrades, explains the potential climate risks faced by Namibia and draws a series of lessons from the findings. Regions such as Namibia are likely to face longer and more intense periods of drought as a result of climate change. Water recycling can save resources. The First Direct Water Reuse project demonstrated that wastewater should no longer be viewed as a waste product, but can be considered a special resource that can fill human needs through specialised treatment. In this respect, wastewater may be considered in a category similar to seawater, which also requires specialised treatment for use as potable water. Water reuse provides one answer to the looming water shortages for arid regions in Southern Africa. This upgrade project also built and provided capacity for wastewater infrastructure that is needed to address large-scale public health concerns stemming from African cities’ inability to provide the wastewater removal and treatment needed to keep pace with record levels of urbanisation. As the cost of cleaning and piping water increases, wastewater reuse offers an increasingly viable solution for communities seeking to cope with growth. After completion, the capacity of the reclamation plant totals 21,000 m3/d. The raw water used consists of treated municipal wastewater. The municipal wastewater from the region is conditioned in the Gammans treatment plant (using a biological nutrient removal process), and polished in maturation ponds before being treated in an advanced multi-barrier system. This employs several barriers for all crucial contaminants, and thus guarantees outstanding drinking water quality. Since its start-up, all the relevant standards have been fulfilled without difficulty. The different steps involved in the treatment process include: Oxidation and pre-ozonation; Powdered activated carbon dosing; Coagulation and flocculation; Dissolved air flotation; Dual media filtration; Main ozonation; Biological activated carbon filtration; Granular activated carbon filtration; Ultrafiltration; Disinfection and stabilisation. The Goreangab Water Reuse Plant was a technical project assisting with SDG Goal 3, ensuring people have clean and sufficient water to maintain health and reduce the chance for waterborne diseases to spread. It fed into SDG Goal 6, ensuring adequate clean water and sanitation for the people of Windhoek. It further addressed Goal 11 and 12, ensuring sustainable cities through effective use of waste in Windhoek and sustainable production and consumption, and Goal 13 as this was an example of a climate resilient city implementation. The plant’s upgrade required pioneering technologies, such as biological activated carbon filtration and granular activated carbon filtration. The process needed to remove four major elements from the wastewater, including physical and organoleptic elements, macro elements, microbiological and disinfection by-products. The process design was one of a ‘multiple barrier’ process. Individual barriers were established for each of these four elements that needed to be removed. The challenge ultimately consisted in the ability of the plant to produce a clean, clear, pathogen-free effluent, with special emphasis on the removal of Cryptosporidium and Giardia. The water reclamation plant provides renewable water for the City of Windhoek in an increasingly arid Namibia. Also, the reuse of treated water allows for the conservation and allocation of freshwater and can enhance the restoration of streams, wetlands and ponds. The use of nutrient-rich treated wastewater for agriculture may lead to a reduction (or elimination) of fertilizer application, and/or increased productivity, and may therefore also contribute to food security. Three lessons emerged from the Windhoek experience. First, the 35-year-long project proved that augmenting drinking water supplies through direct reuse of water could be undertaken in a safe and responsible way. However, if geographical circumstances allow, the use of an indirect reclamation plant that, for example, allows reclaimed water to be stored in an aquifer is recommended. Second, a multi-disciplinary team approach was essential in ensuring proper installation and operation of the technologies was employed. Additionally, proper monitoring was important to ensure safety of the finished product. Third, policies and regulations at national and local levels were needed for proper support to ensure long-term safety and sustainability. FRACTAL (2017). Ensuring future water security through direct potable reuse in Windhoek, Namibia. Inspiring climate action in African cities: Practical options for resilient pathways.